Car jacks are standard equipment on cars and have been for over a century. Sadly, they have not always been designed for the vehicle owner use and are merely an afterthought when piecing the car together. There are models of jacks where it is easier to pinch your fingers than use it to lift a car. Some manual jacks are better than others and always come with a lug wrench so you can remove the lug nut from your tires even when stuck on the side of the road. Yet like everything else the manual jack is giving way to its electronic cousin. An electric car jack is simply a modified manual car jack that operates with 12 volt electricity instead of old fashioned human power. The kits usually come with all the tools you need to safely and quickly repair your car or change your tire. The personal electronic jack is probably a must now for every car owner and here are some of the reasons why you can benefit from an electric car jack set. 1) It is compact and easy to store in the trunk of your car while manual jacks are usually given a good storage spot by car makers these are sometimes hard to access and take more time to retrieve the jack. 2) It is lightweight and easy to manage making the handling of this jack easy and convenient. 3) Can be used by anyone, just about anywhere. Manual jacks are not for everyone and many a woman are put in possible danger when they have to flag down a passing car to get help. These jacks are easy to use and can be used by all women as well as men. 4) Saves time when fixing your car. Manual jacks can be time consuming to set up and position properly. 5) Can lift heavier weights than manual jacks. Some versions of the electric car jack kit can lift up to 2000 kg making tire repair less stressful. 6) The motor does all the work so even senior citizens can use this kit. 7) You can get up to 14 inches of lift. High enough for any simple car repair. 8) Kits come with all the tools you need to change a tire or make a quick repair. 9) Hooks up to your car battery with a long cord so you can fix any part of the car or change any of the tires. 11) The motor runs quietly and smoothly. 12) Do not need a lot of strength to operate an electric jack. These are many of the benefits that come with using an electric car jack kit. Another great benefit is that you do not have to spend a lot of money to purchase one. The cost of these kits range in price with the best more expensive than the others and lesser quality sets. 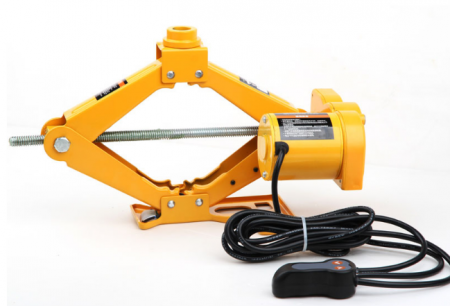 Are you looking for an affordable electric car jack? 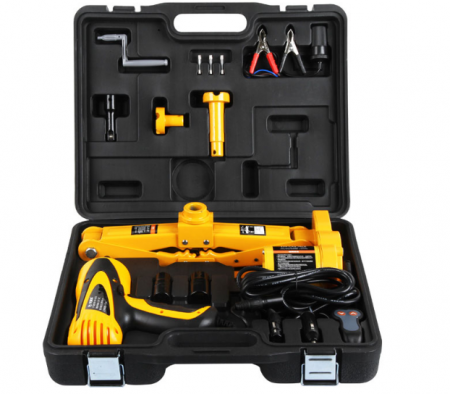 If you are, check out the 12V electric car jack with electric wrench set at Lazada Malaysia. The kit compact and light with and very easy to operate. All you have to do is plug it into your car cigarette lighter socket, press a button and it will lift your car up automatically. The great thing is you get all the tools you need to make quick car or tire repairs. Another thing to consider is that manual jacks often require a lot of physical strength to operate. It is not easy trying to manually lift a heavy car and if you are not endowed with super strength to operate the manual jacks then car repairs and tire changes become an impossible task. You need to find a kind stranger to stop and help you or you use your cell phone to call a family member to come to your rescue. But if your car stops where you cannot get cell phone service then you are really out of luck. Electric car jack kits spare you these difficulties as their easy use allows anyone to hook up the jack to their car and make the proper repairs to the vehicle. Electric car jack kits come in different shapes and sizes and weight capacities. You need to make sure you buy the right jack that will lift your car when you need it. If you purchase one that does not have the capacity to lift your car then you have done nothing but wasted your money. Be sure before you buy so you won’t be stuck in some remote location and have no way to get out of trouble.